The castle at Kirkoswald is a wonderful secret. Hidden from view by a screen of trees, it's not even totally visible from the foot path that runs along side the West side of the moat. Above. The one remaining tower hides behind the trees. The thickness of the trees hides all but the most fleeting view of the last remaining upstanding portion of this castle...the corner of a stair turret, soaring to a spectacular four stories. Above. The tower looking North West. The castle remains lay to the South East of the village, just off the small B road that finally terminates in Busk. Still surrounded on all four sides by the water filled wet moat, the castle is a shadow of its former self. Above. One of the surviving vaults. 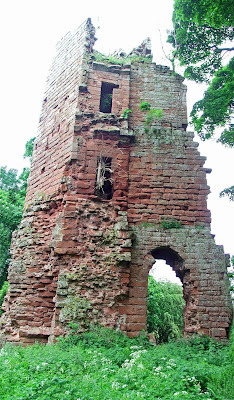 The North West stair turret, the only surviving portion of the hall to the North of the castle, stands precariously over the fallen remains of a hall, courtyard, postern, various towers and vaults. The roof and wall rubble stands to around 8 feet in the centre of the ruins, and now, covered in grass and undergrowth, give the castle a rather green and wild feeling. The moat fully surrounds the castle, is about 15 feet wide, and about 4 to 6 feet deep in various places. The main entrance across the moat, would once have been in the Western side, with a possible postern or second entrance in the Eastern corner, where the moat is strangely inset. To the North West, a small mound still sits somewhat on its own, and it has been suggested that this could have been a motte...perhaps part of the original fortification of this site. The remains, once over the moat, are many and varied. There are a set of vaulted chambers still accessible in the centre of the remains, their arched entrances free of both undergrowth and fallen masonry. Elsewhere, huge blocks of fallen sandstone lay scattered around in what was once the courtyard, at the very centre of the castle. What isn't buried, is piled high in heaps of loose masonry, and stonework still bound together with mortar. Above. A view of the tower, showing the corridors within the thickness of its walls. The original fortification at Kirkoswald, most probably stood on the platform at the centre of the earthworks below St Cuthberts in the middle of the village. This building would most likely have been a wooden tower, surrounded by earthen defences, and would have been in existence during the early part of the 12th century. Built by Ranulhph Engaine, the manor later passed by marriage to Simon de Moreville, whose sone, Hugh later received a licence to crenellate his dwelling in 1201. Above. A view of the Western courtyard. The manor and lands then passed to Richard de Lucy from Egremont, and then to the de Multons in around 1213. The manor, and the castle in particular were granted to John de Castre in 1310, and it's likely that the castle at this particular site was built sometime in this period. Indeed, a castle here was destroyed by the Scots in 1314, resulting in a rebuild, possibly in stone, of the castle in 1317. Above. The moat on the Eastern side of the castle. The castle at this time, passed to Ranulph, Lord Dacre, who had further additions made to the castle. Further parts of the castle were strengthened and added to in 1485 by Thomas Dacre, who finished adding the moat. In 1569, the castle was forfeited to the crown, when the Dacres were implicated in the Rising of the North. The castle passed by marriage to Lord William Howard, but up until around 1601, it was allowed to fall into disrepair. Between 1604 and 1624, the castle was slowly stripped of building materials of any worth, with lead and timber being transported to, and used at Naworth. In 1688, it was described as "a bare shell or heap of stones", and from then till now, has gradually been allowed to fall further into dilapidation. Above. View of the Western courtyard from the Southern corner. There are signs along the footpath that runs along the Western side of the moat, warning that entry is prohibited due to the unsafe tower and buildings, but I'm sure during winter, with no leaves on the trees, good views can be had from the safety of the footpath.